This is the third installment of the story, Murder on Main Street. This installments is by Gloria Harchar. I have posted her bio then the story. Happily married to her husband who was her first date ever, she lives in a beautiful 1936 circa home. She has two Bachelors' of Science degrees: One in education and the other in accounting. She's had diverse jobs such as a neuropsychopharmacology lab technician, a Government Liaison Representative, an Internal Auditor, an English, Social Studies and Computer teacher for middle school students at an at-risk school in north Tulsa. All of her on-the-job experiences and life in general are great fodder for ideas! She loves to hike and to experience America from the back of a bicycle, and is hoping to cycle through Europe some day. Her philosophy is to listen, watch and live life to its fullest. You can find out more about her by visiting www.gloriaharchar.com. Tory sighed, glad to flip the welcome sign to Closed. It had been a long day. As she tidied up, she glanced out the window. Several ladies were across the street with their heads together. Two glanced toward Tory's shop with a frown. It wasn't hard to guess they had her tried and found guilty. If it was up to them, she would be in the Oklahoma State Penitentiary. Funny how many people had dropped by the teashop, folks who hadn’t visited until today. Not to buy, but to gawk at the primary suspect. Tory. The trouble had started with that obnoxious Detective Jamison. To think she had considered him cute! The longer she stewed on Jamison and his veiled accusation, the angrier she became. Well, she wouldn’t depend on him to clear her name. She would do her own sleuthing. To find out how, she would visit The Book Worm. After locking the teashop, she walked toward the quaint establishment. Fred Crawley, the bookstore owner, smiled when he saw her. "Hello, Miss Tory. Anything I can help you with?" Releasing her breath, she relaxed, realizing he must not have heard the news. "Do you have any books on solving crimes?" “Thanks, Fred.“ She flipped through the pages of several volumes. Awhile later, just as she reached for another book, she heard the sound of shoe leather scraping against the wooden floor. “Hello?” she called. Silence greeted her. Fine hairs on the nape of her neck rose. She looked, but didn’t see anybody. Shrugging, she decided on The Detective’s Handbook. The bookcase gave an ominous crack. Instinctively, she hurled out of the way of the teetering monstrosity. The seven-foot, half-ton bookcase fell with a crash, shaking the old oak floor. The dust settled. A cold knot twisted in Tory's stomach. If she hadn't moved, she would be dead. “I don’t blame you. You look plum wore out,” Fred replied. Forget going to the movies with Barry. As she walked to her car, her knees wobbled. No, she would spend a quiet night reading -- which she did. In fact, she thoroughly enjoyed her studies. The next morning, with the book's tips in mind, she decided to practice her sleuthing by scoping out the yard, then her neighborhood. After snooping around looking for footprints, she felt a little silly, though. She didn’t even know where to start with this investigating business. With a sigh, she slid into her car. An ominous jangle broke the silence, and for a second, Tory thought it was a baby‘s rattle. Then she glanced down at the floorboard. A rattlesnake. The diamond-shaped head bobbed at her, forked tongue flicking. As the deadly reptile prepared to stick its fangs into her tender skin, she realized Mr. Richards had never been the target. No. Somebody wanted to murder her. The next installment of this six part story will be posted next Saturday so stay tuned. Oh, I hope not. But as I stare at the piles of books that literally surround me on my desk, I have to wonder. I collect books like some people collect movies, dates, or experiences. And at the rate I collect them, I'll never catch up. Especially if I keep doing other things like cooking, cleaning, caring for my family. Not to mention writing, teaching, etc. But there are several books I really want to get to. I have this idea to do a series on the blogs I write for with the guys who write legal suspense -- I really don't know many gals in CBA that do, and I'm not sure Lisa Scottoline would open my email LOL. It would be fun to include John Grisham, but I'm afraid I'd have a similar problem. I'd love to have him keynote ACFW some year, but don't think we could afford him. It would be pretty awesome though. I love to study folks who write and plot well and these authors do. So here's a question for you, oh faithful readers... If you could ask an author anything what would it be? And if you could ask a legal suspense writer anything what would it be? If you like legal suspense, who's your favorite author? Let me know, and I'll incorporate the questions into the interviews. Randy Singer's already said yes, and I think I can get several others to participate. Then in October we can learn what makes these writers tick together. And how they come up with their diabolically twisted plots! We’ve taken a break for the last few weeks, but it’s time to continue working our way through WRITING THE BREAKOUT NOVEL WORKBOOK, by Donald Maass. Picking up where we left off, puts us at lesson 23, Burdensome Backstory. Once again, Maass stirs up controversy with his no-backstory-in-the-first-fifty-pages rule. Fifty pages? No backstory? Quick, sit down and put your head between your knees. I don’t want you or anyone else passing out while reading this blog. Kidding aside, Maass makes a good point. Backstory placed too early in the story bores the reader. Added later, once the conflict--especially inner conflict--has been established, backstory develops and deepens the conflict and thus enhances the story. Maass’ rule goes counter to what gut instinct tells us, as writers. After all, we want to establish who our hero or heroine is early on. As we craft those first scenes, we’re getting to know that character and the backstory seems important. Yet, we have to remember: what the writer needs to know to create the story and what the reader needs to know to enjoy the story are two different things. To ensure we create compelling and multi-layered characters, writers must be aware of their characters’ past as well as what happens in the present. Thus, introducing backstory makes perfect sense to the writer, but a reader only wants information necessary for the story to unfold. When we withhold backstory from the reader early on and drizzle it in lightly once they’ve established a relationship with the character, we end up with a more powerful and effective tale. When in doubt, add backstory sparingly after the first fifty pages. Only reveal information needed for the story. Anything else, withhold completely. CHECK OUT MY NEW WEB SITE CREATED BY AUTHOR DESIGNS! Today we're welcoming Martha Gabler, the heroine of The Guardian's Mission, Shirlee McCoy, August 2008. Wow, you've just had quite an adventure. 1. Tell us a little about yourself and how you came to be in the midst of such suspense. I'm just an ordinary person, a veterinary technician living in the same small town I grew up in. Everyone talks about everyone in Lakeview, and when I broke up with my fiancé, I knew it was leave town for a couple of days or listen to a thousand people tell me they knew Brian McMath wasn't the guy for me. Hello?! I could have used that information a little sooner. My dad's hunting cabin seemed like the perfect place to hide out for a few days. It's way off the beaten track up in the Blue Ridge Mountains, and I knew none of my friends would follow me there. A couple of packs of tissue, a double supply of chocolate and I was ready for anything. 2. So, during the book you met Tristan Sinclair. Tell us a bit about him. What was your first impression? When did you know it was love? Love? I thought he wanted to kill me. I walked into my father's cabin and straight into his arms, and I very nearly got us both killed trying to escape. Fortunately, Tristan isn't the kind of guy to panic. He got us out of a very scary situation and got shot in the process. I thought that was that, but he showed up on my doorstep a day later and told me I was in danger and that he was going to be my bodyguard. Can you believe it? Capable, independent Martha Gabler needing a bodyguard? I thought the idea was laughable, but Tristan was determined. He's the kind of guy you can depend on. Strong and compassionate and more than willing to do what it takes to protect the people he loves. It didn't take me long to realize I needed him. Not just for a while. Forever. 3. What strengths/skills do you have? As I said, I'm capable and independent. I know how to take care of myself and anyone else who wanders into my life. What is your greatest weakness? I'm afraid to love completely. My mother walked out on me and my dad when I was a kid, and it's been hard to trust in love since them. Until I met Tristan, I really didn't think there'd ever be a person I could be completely myself with. With him, I'm not afraid to believe in happily-ever-after. 4. What scares you? The thought of losing someone dear to me. 5. If you could change one thing about yourself, what would it be? Aside from growing a few inches taller and losing a few pounds? What I'd really like to change is my need to control things. Sometimes I don't know when to let go and let others. 6. Where are you in your faith at the start of your story? When my story begins, I'm a strong Christian who has made a poor decision. I wanted something desperately and I went after it without listening to the quiet voice inside that was telling me to wait. Sometimes I still kick myself over my decision to get engaged to a man who really didn't love me, but then I remember that decision brought me into Tristan's life. God really does work everything out the way He intends it to be. 7. Where are you in your faith at the end of the story? I've learned that a few minutes of prayer can save a woman a truck load of regret! 8. You've got a scripture at the beginning of the story. Tell us why this scripture is significant. Matthew 7:13-14. This refers to Christ as the only way to salvation, but I also see it as a reminder of how easily we can get off the path God wants us to travel. It's easy to do the wrong thing for what seems like right reasons. That's how I ended up engaged to Brian. I wanted a family and I wanted a home. There didn't seem to be anything wrong with that. The problem was, it wasn't what God wanted for me. 9. If you could be a dessert what would you be and why? Deep dish apple pie with a scoop of ice cream. Why? Because it's Tristan's favorite! Thank you Shirlee for lending us Martha today. I'm looking forward to reading this book. Today was the first day of school. As a teacher, I've never really had to forfeit the first day of school. I get them often. Twice a year as a matter of fact. Yes, I usually buy a new outfit. I always buy new notebooks and folders. I taught three classes today: an English 061, an English 071, and an English 101. In each class, I gave a questionnaire. I ask the question "What was the last book you read?" Today, roughly 75 students told me. Er, actually four left it blank and three admitted either they didn't remember or they never read. Nineteenth Wife right now. I'm fascinated and disturbed. I'm also reading The Sisterhood of the Dropped Stitches and How to be a Mid-life Mom. Stephen King is the all-time winner of my freshman queries. He only had one book today, but every semester, he's mentioned. Danielle Steele and John Grisham often are mentioned. Lately, the up and coming series is Twilight. I had more mentions of that than any other book. Harry Potter, for the first time in years, was not mentioned. The Bible was mentioned, specifically the book of Psalm. The Shack was mentioned. Made me feel a bit inadequate. I own The Shack. I started it. I cannot get past page eight. Maybe because I have a toddler and the content made me want to cry. Many students post what their high school senior English teachers require. I see a lot of The Bell Jar. I see Gatsby. I see Fast Food Nation. My students will get a lot of Langston Hughes from me. O Henry comes in second. I've had them read All Things Great and Small by James Herriot. Until I taught the book, I didn't even notice all the British slang. Minor Adjustment by Beverly Summers - an old Kismet book. There's a young adult by Carolyn B. Clooney, but I don't recall it's name. I'll dig through my books and find it. I've read it about ten times. It's that good. Okay, guys, which books did I leave off. This is a six part series called Murder on Main Street. I will be posting one part each Saturday. If you missed the first segment go back to last Saturday and read it first. 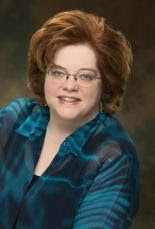 Vickie McDonough, an award-winning inspirational romance author, has written 12 novels and novellas. 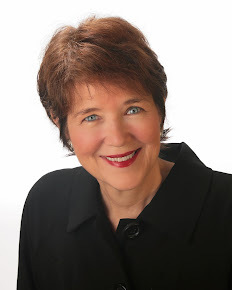 Her stories have continually placed in prestigious contests, such as the ACFW Book of the Year and Noble Theme contests, the Inspirational Readers Choice Contest, and Heartsong Presents annual readers' contest. 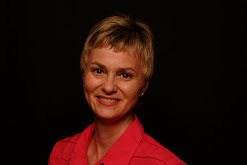 She is active in local and online writers' groups and enjoys mentoring new writers. Vickie has been married to her wonderful husband, Robert, for 32 years. They have four terrific sons and have finally evened the odds with a sweet daughter-in-law and a granddaughter. She has lived Oklahoma all her life, except for one exciting year when she and husband lived on a kibbutz in Israel. When she's not writing, Vickie loves to read, watch movies, and travel. 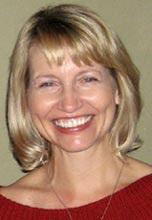 You can learn more about her at her Web site: www.vickiemcdonough.com. Tory’s heart thudded and her throat tightened as she struggled to comprehend what she saw. With a trembling hand, she reached out, searching for a pulse on Gilford Richard’s neck. The man lay slumped over his tea, which had spilled onto his lap. What happened? Had her vehement opposition stressed Mr. Richards to the point of him having a heart attack? “I’ll call Barry.” Her fiancé would know what to do. Ten minutes later, Tory sat in the serving area of tea room, watching the police going in and out of her shop. An officer carried out a plastic bag holding her favorite English tea cups and another bag held the box of her special Oolong blend. Tory shredded a paper napkin and blinked back tears. What could have happen? She glanced out the front window, wincing at the sight of the growing crowd of curious spectators. How would this affect business? And where was Barry? Tory looked up to see a stranger. Serious sky blue eyes stared at her from a tanned face. He fit the cliché—tall, dark, and handsome. Her heart flip-flopped, and she chastised herself for being attracted to him. After all, she was engaged. Jamison's brows dipped, and he studied her with an intense gaze. She resisted the urge to squirm. Jamison made some notes, then he asked a few more personal and pointed questions. You'd think I hate my kids. I really don't. I'm just the average mother with teenagers. (I have 4.) Like many mothers, the end of August represents freedom for me because the kids are about to go back to school. YAY! For writer's who work at home, this freedom comes in the form of more uninterrupted time to write. "You work at home. You can write whenever you want." True, but not with teenagers. At least, not the way you think. And definitely not when there is so much preparation to do before school. Have you ever gone school clothes shopping with 4 teenagers? It's a wonder I have any hair left on my head. And since I live in a rural area of Massachusetts, the kids rely on me to take them wherever they need to go. My kids are convinced all I do is type, so how bad can it really be for them to interrupt me 50 times a day? Explaining to them that creativity and good writing takes time and thought and structure usually ends up falling on deaf ears because to them all I do IS type. It was easier to write when the kids were younger. They would go to bed early and I'd turn on the computer. Even if I wrote until well after midnight, I could easily get in a few uninterrupted hours of writing time. Since my kids are teenagers, they don't go to bed at 8:00 anymore. And since they need me desperately for ________(fill in reason ranging from "Does this make me look fat" to "He won't give me the remote control" to whatever other teenage tragedy that can occur.) creativity must come in short bursts instead of long stretches in order to get my writing in each day. I've gotten to the point where writing in the wee hours of the morning is the only time I can get quiet time to write in. If you see me online at 2:30 AM, I'm not checking CNN Politics, I'm researching a book or I'm writing. Picture me smiling on August 26th, the first day of high school. My kids will get on the bus and I'll walk into my kitchen and clean the house for about an hour. I'll enjoy quiet and order for a whole 7 hours where the only interruption I'll have is the dog whining to go outside until the bus comes to drop the kids off in the afternoon. During those 7 hours I will celebrate the fact that I have been blessed with wonderful children I love. And all I'll do is type. Take a moment, look at the picture again, especially at the first woman on the left. The tall one, who is smiling. Her name is Karen Harter and you need to notice her elegance. Quite a few months ago, I got the most amazing phone call. Yup, I'm still talking about the one telling me Pursuit of Justice was a RITA finalist. If you've paid attention to Mondays, you'll see a fringe benefit that came from being a finalist. The fringe benefit was the spirit of comaraderie, kinship. The eight of us got together and blogged. We called ourselves the Rita Gang. Then, five of us made it to San Francisco where we stood together at the Friday ceremony. We ate lunch together the day of the RITA. Then, we celebrated together when Linda won. Karen Harter was a trooper. See, she was ill, very ill. So ill that she needed to bring her niece (one of the most charming young ladies I've ever met) along to act as a helper. Yet, Karen smiled through every moment, so excited about her nomination, so excited about being there among peers. She did everything there was to do, even taking a second cab when the six of us couldn't find a big enough one to get us back from an away lunch to a hotel practice. Let me tell you about Karen Harter. She was tall and graceful. Her eyes looked out at the world in wonderment. She knew how to laugh. At lunch, she talked about God and her writing. She wished everyone could see God in their writing. Karen is no longer ill. She passed away yesterday. The news floored the RITA gang. We will miss her. Over on my blog, I'm giving away copies of my books in honor of the Olympics. So if you've wanted to read Deadly Exposure or one of my historical World War Two romances, slide on over and post a comment here. For every ten comments, I'm drawing a name. I drew two last night, but would love to give away more books. I spent the weekend in Ohio doing research for my next World War Two romance series. We spent four hours at Wright Patterson, and didn't even scratch the surface. Literally. We practically raced through one building leaving two more unexplored. Everywhere I turned I saw story ideas. Not enough for a full book, but enough to add layers. My mind is spinning on the challenge of writing a World War Two suspense with a female attorney. That's all I've figured out yet. But each exhibit. Each placard. Each plane. They all plant seeds, and someday they'll germinate and come together as an idea that makes the what if that propels a book. Can you put up with one more post about RWA Nationals? As always, I came home with so much great information and want to share a few tips I picked up throughout the week. Brenda Novak talked about layering conflict. She starts with the suspense and then builds the romance from there. Personal conflict is important so the reader will care about the characters. Brenda suggested always going deeper with conflict. Write prologues in the present and not the past so the action occurs in real time. ●Readers pick up on subtle movement, etc. Brenda added that great characters traits have flip sides that can cause them problems. Screenwriter Blake Snyder spoke about his years in Hollywood. His book, SAVE THE CAT, is a must read for writers, and I hope to get it soon. Blake encouraged us to capture the concept of our story in one sentence. He said the pitch is the verbal telling of the story. Blake talked about his 15-point structure, which can be downloaded from his Web site. In the books he’s sees, the hero’s problems aren’t bad enough and/or the character doesn’t hurt enough. Make it bad at the onset, he suggested. 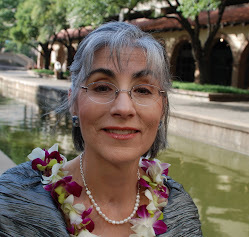 Wendy Corsi Straub writes twelve hours a day for the four to six weeks when she pens a book. Then she takes a few weeks off and starts again. She knows, if she’s bored writing, the reader will be too. Don’t have stock characters, she warned. Make them do the opposite of what’s expected. She has her own social community we’re all invited to join at wendycorsistraub.com. Just like Maass, Wendy said don’t start the book in a car, train or plane. Start at the destination and let the story flow from there. RWA is always an exciting week packed great workshops and lots of events. The highlight is seeing old friends and meeting new ones. This year, as always, I came back enthused and ready to work. Everyone was thrilled when Linda Goodnight won her RITA!!! The photo above shows the Steeple Hill authors after the awards ceremony. Good news! My second book, SCARED TO DEATH is a finalist in the Georgia Romance Writer’s Maggie Award of Excellence. Congratulations to all the finalists. 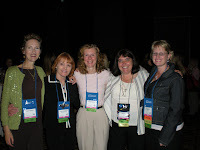 Hope to see you at the Moonlight and Magnolias Conference this October in Atlanta. 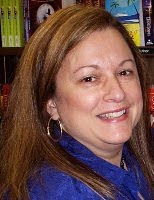 I’m blogging on www.seekerville.blogspot.com today and talking about The Write Way to publication. Stop by and say hello! Visit my NEW Web site created by Author Designs! Today we're welcoming Amy Graham, the heroine/hero of RIVER OF SECRETS by Lynette Eason, released in August. Wow, you've just had quite an adventure. You’re not kidding. It’s one I wouldn’t want to repeat, but wouldn’t have missed the outcome for the world! 1. Tell us a little about yourself and how you came to be in the midst of such suspense. I am Cassidy McKnight’s best friend. I helped her out in the story before mine when she was having so much trouble. When I found out that my mother was at the root of her troubles, it sent my life into a tailspin. Suddenly, nothing in my life was as I knew it to be. Everything I’d believed in turned out to be a lit. Except the Lord. So, I did a lot of praying, packed my bags and headed for Brazil, to an orphanage that needed my nursing skills. In the middle of an epidemic, we all slaved to save the lives of the staff and children. One patient stood out. A very sick man who suffered from amnesia…and who had been scarred from a terrible fire once upon a time. One day, I stumbled upon someone trying to kill him. After that, everything seemed to snowball and we found ourselves fighting for our lives. 2. So, during the book you met Micah McKnight. Tell us a bit about him/her. What was your first impression? When did you know it was love? Micah was my best friend’s brother. He did his best to keep his sister and me out of trouble when we were younger. But then he joined the Navy Seals and disappeared on a mission two and half years ago. I didn’t recognize him at first because of the scars, but once I realized who he was, I was overjoyed and devastated at the same time. My first impression of Micah was that he was one of the strongest men I’d ever met. He’d overcome incredible odds and I admired him greatly. And while he wasn’t the most handsome man I’d ever seen, his looks didn’t matter. His goodness, gentleness, and tough as nails stubbornness touched my heart. I don’t know that I can pinpoint an exact time that I knew it was love. I had a crush on him as a teen, but even before I realized he was Micah, I was falling for him during the special times we managed to spend together at the orphanage. 3. What strengths/skills do you have? I’m a nurse. I come from a wealthy family, but my mother wasn’t exactly thrilled with my decision to go into nursing. So, I played the dutiful daughter and did what she wanted me to for a long time. But after her betrayal, I realized what was important. And that is doing what God wants me to do. I have an enormous amount of compassion for hurting people. I’m also stubborn and willing to go after what I want even though that trait lands me in trouble occasionally. What is your greatest weakness? I think my greatest weakness would have to be fear. Sounds like a direct contrast to my strength, doesn’t it? But, I let fear hold me back from telling Micah I knew his identity and that came back to haunt me. I don’t like confrontations and I guess God’s been making me face my fears because confrontations is all I’ve had lately! 4. What scares you? Having someone I love mad at me. The thought of losing Micah forever scared me to death. My mother! 5. If you could change one thing about yourself, what would it be? I’d probably change my “I’ll do it myself” attitude. I’m not very good at asking for help. Sometimes I think I know best and instead of listening to good advice from friends and people who know better, I strike out on my own…and often strike out. Ha. 6. Where are you in your faith at the start of your story? I’m a new Christian. Which is a good thing because I sure needed God to get me through this new adventure I’d gotten myself into. 7. Where are you in your faith at the end of the story? Stronger, deeper, and more in love with God than ever. He stayed true to His promises and never left me even when I didn’t understand why things were happening as they were. By the end, He showed me His love was exactly as He said. Steadfast and everlasting. What a great God! 8. You've got a scripture at the beginning of the story. Tell us why this scripture is significant. 1 Samuel 16:17 – “For God sees not as man sees, for man looks at the outward appearance, but the Lord looks at the heart.” Micah was scarred from the fire he’d survived. And he was quite self-conscious about his scars, wondering if a woman would ever look past them to see the man within. Amy quotes this scripture to him when he confesses his fears to her and he realizes at that time what a special woman she is. And it draws him closer to a God he’s not sure about at this point. I think it’s important for everyone to know that God looks within. He cares about our heart, our feelings, our needs. He understands our motives, our insecurities. To me, that’s so much more important than what we look like on the outside. Yes, we need to take care of our physical bodies, watch what we eat, exercise, etc., but the inside, our spiritual well-being, should be the priority. And that’s how we should view others, from the inside out. 9. If you could be a dessert what would you be and why? Anything chocolate. It’s savory, sweet, multi-faceted. Everyone loves it because when you eat it you can’t be in a bad mood! Terri, thanks so much for having me today. I hope readers will purchase RIVER OF SECRETS and enjoy my story. It was a roller coaster ride with a beautiful ending! Your welcome Lynette, we appreciate you sharing Amy with us. I can't wait to read this book. Those were the words I overheard my sister say about her new son-in-law. Right now, I'm the traveling Craftie Lady. It's early a.m. in Trinidad, Colorado, and I'm in the business center of a Quality Inn. I snuck down here while my husband and son sleep. I really haven't been home for three weeks and it's all because of words like "He's loved her since ninth grade." Three weeks ago I was in San Francisco because in my fiction, I build worlds where a hero would indeed love the heroine "...since ninth grade." Two weeks ago I was in Chama, New Mexico, riding an historic narrow guage train. I was standing next to my husband who didn't know me in ninth grade. He did, however, say the words "I love you" first! Believe me, I remember. He also called down to the recovery room after our son was born because they were keeping me too long with them and he wanted me up in the room with him. But, I digress. We went on the train because my son, who'se not in ninth grade yet, loves Thomas the Train. The first half of the trip was spent in an open air car, holding Mikey up so he would see the sights, and the second half was spent with Mikey asleep on a seat and my husband and I alone in the open air car. Oh, other people were there, but we didn't see them. 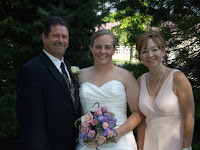 One week ago, we arrived in Omaha, Nebraska, for my neice's wedding. It was a fairy tale. She got married on a ranch, arrived in an antique carriage, and afterwards there was a barn dance. The groom had loved her since ninth grade...sigh. Me, I got one dance with an exhausted three year old and half a dance with a handsome husband. Why the half dance? Well, it was more than time to take the exhuasted three year old home. From a writer's viewpoint. I saw romance everywhere, including on the train where Grandpa - my husband's dad - and his girlfriend - a romance writer, too. Yup, I fixed them up - cuddled together. It doesn't matter if you're in ninth grade or ninty, appreciate who you are with! Oh, and from a writer's viewpoint, I didn't get much writing down. I'm going to bury myself in a hole for the next two weeks since I have a September 4th deadline. I'll put a sign that says "Husbands and three-year-olds not allowed". 1. Practice goal setting--weekly, monthly, yearly, even five year plans. Reaching a destination is a whole lot easier with a map. 2. Record every positive step you take towards your goals. Review them often. Without this, it may seem as if you are at a stand-still as the months go by. I filled pages of my Franklin planner with details of calls I made, contacts, critique sessions, when I ordered a writing book or joined a chapter, or wrote a newsletter article. Even when a first sale still seemed far away, I could see proof of the positive steps I was taking, and the satisfaction of checking off more items on my list was added encouragement. 3. Have a COMPLETE ms before you talk to editors and agents...because that's what they'll probably ask for. If it takes a year for you to get that full ms finished and sent after such a request, that editor might be at a different house by then...and an agent has just had proof that you aren't going to be productive! 4. Keep up-to-date files on agents, editors, publishers, houses, and reviewers. Take notes at conferences. Network with other writers at conferences. Workshops can be of great benefit, but sometimes the hallway networking can be just as helpful! 5. It goes without saying that you've extensively read your target publishing house and line. That you have read so many of their books that you have that publisher's type of storyline embedded in your heart. Publishers are definitely not "one size fits all", and doing your homework can save you a lot of time in the long run! Next time, I'd like to continue talking about upping your chances for success...and would love to hear some good hints from people reading this blog, too. Hope to see you again! My critique partners and I wrote a short six part mystery that I will be posting over the next six weeks on Saturday. Below is the first installment by Therese Stenzel. I hope you have fun figuring out whodunit. Tori Bradford’s blonde bangs softly brushed across her forehead as she strode down Main Street. She smiled at several shopkeepers who were busy opening their antique stores. Living in Jenks, with her new tea shop and a new love in her life, made being single at forty-two...promising. She took in a breath of the crisp fall air and pushed open the front door to Victoria’s Tea Shop. A jingle of bells sounded, and the smell of fresh baked scones filled the air. Tori’s stomach fluttered with anticipation of seeing him again. Ever since her grandmother had willed her the business in a prime location, banker Barry Sanderson had grown into more than a friend. And now that her shop was threatened by imminent construction next door, he had become her confidant and her rock. “Shall I make your special tea?” Mrs. Beavers peered over her spectacles. A jingle of bells in the background suggested Richards had just arrived. Something in his smile and murderous grip made her flinch. After signing the disputed delivery receipt, she returned to face her adversary. Her heart clenched. A faint aroma of almonds lingered in the air. Mr. Richards was slumped forward, his head resting in a pool of Imperial tea. Look for the next installment next Saturday. Julia Child was a SPY!! With news this week that Julia Child was secretly working as a spy for the CIA during WWII, it got me thinking about our romance heroines. We write about ordinary women who find themselves in extraordinary situations. My favorite type of story! All that time we thought Julia was just baking pastry, she was living a double life! How cool is that? I love stories about the WWII era for several reasons. Some of my favorite romantic suspense movies take place during that era. Shining Through, starring Melanie Griffith and Michael Douglas is one that I could watch over and over again. Every Time We Say Goodbye staring Tom Hanks is another wonderful romance. They needed to rely on their faith in God to see them through. And when they survived, they came to America in search of freedom. I love watching my mother in law's face when she talks about coming into Ellis Island and seeing the Statue of Liberty for the first time. I always tell her that she survived just so she could come to America and bring me my family. She's a strong woman and a fabulous example of a great romance heroine. These are stories that I've always wanted to pass on to my four children to let them know what their grandparents and great-grandparents went through to give them freedom. One day I will write these stories down and perhaps put them in stories that I can share with my readers. I love the fact that Love Inspired Historicals is including the WWII era in their lineup of books. I'll be sure to pick up every copy! In this book, author Colleen Coble takes her characters’ deep into a mix of mystery and suspense as well as relational issues. The book opens with the stalker in Allie’s residence taunting her. In a panic, Allie grabs Betsy and runs to the only place she can think to hide that also promises safety. The only problems: she has no money, nobody expects her, and she can’t tell anybody what’s really going on for fear the stalker will find her. The book is filled with romantic twists that kept me turning the pages as much as the suspense did. She’s been so focused on surviving since her husband died, that she hasn’t had time to fully grieve. Romance is the last thing she is looking for, especially when the only men around are ranch hands and Rich Bailey, the handsome foreman. Everything conspires to keep Allie isolated, yet for the sake of her daughter she will do things she never imagined. 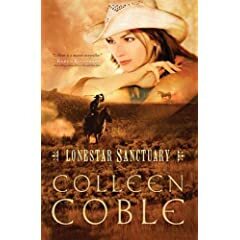 The tension is high as the stalker continues to strip Allie of everything important to her and strange events occur at the ranch. Just when it doesn’t seem like things can get worse, Allie faces a custody battle that could destroy Betsy. The setting is rich. I could picture the isolated Texas setting, and almost taste the grit in my mouth. The characters are richly drawn and detailed, with even the supporting cast causing me to root for them. This was a book I couldn’t put down. Fortunately, I read it on a plane so I had uninterrupted hours to inhale it. Guess where I left my heart? San Francisco, of course! The last few weeks have been a whirlwind with the Romance Writers of America Conference as well as the Faith, Hope and Love Conference. I had the honor and pleasure to work on the FHL committee with coordinator Narelle Atkins. Narelle’s from Australia and has a beautiful accent as well as great poise speaking before a group. She kept us on track and, in fact, ahead of schedule, which is always a tough task. I continue to be amazed that someone living thousands of miles away could organize such a great event. Mom and writer, Narelle appears to be able to juggle many jobs well. She’s got my vote for president when FHL election time rolls around. Nancy Farrier’s another savvy gal who transported boxes of goodies sent by authors and publishers from her Apple Valley, CA, home (Trivia: Dale Evans and Roy Rogers lived in Apple Valley.) to SF. Nancy’s published 13 Heartsong Presents novel. Be sure to order her books online. Nancy and her roomie and my good friend Missy Tippens were in the overflow hotel, which meant a hefty hike back and forth to the RWA conference Marriott every day. Sore feet made everyone realize how important comfy supportive shoes are at conferences. Thought I’d pass on a few things I picked up at the FHL one-day conference. Our own Craftie Lady Roxanne Rustand give a fantastic workshop that I’m sure she’ll highlight in some of her blogs so I won’t steal her thunder. Roxanne’s an accomplished writer and a delightful speaker, and it was a joy to get to know her better. Gail Gaymer Martin mentioned her use of a time line sheet to outline her stories, which includes a real time date, something I plan to try for my next story. She adds the chapter numbers and the significance of each scene in the story as well as the POV character and keeps the time line as a handy reference whiles she writes and rewrites. Referencing Donald Maass, Gail reminded us that backstory should NOT be included in the first fifty pages of our stories. Every scene has to have a crisis. Another tip to paste on my computer. Gail suggested a reference book by Debra Tannen, THE DIFFERENCE BETWEEN MEN AND WOMEN’S MINDS. Characters need a purpose at the onset of the story then make it a life and death situation as the story develops. She also said to add a character later in the story to create conflict or to serve as a red herring. And never have the characters say “I love you” until the end. The editor/agent panel was great. Avon Inspire editor Cynthia DiTiberio mentioned heroine names commonly used and said to stay away from the following: Allie, Abbie, Anne, Kate, Jane, Katie and Sarah. Yikes, I’ve got Sarah and Kate and Allison, which is close to Allie, as heroines. More info to paste to my computer! 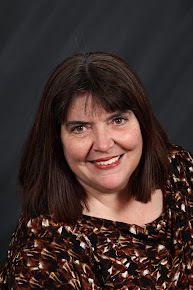 Agent Michelle Grajkowski, 3 Seas Literary, is taking only email submissions. Because of the growing market in eBooks, she cautioned authors to pay close attention to their electronic rights in contracts. Lyn Cote, in her inspiring keynote, shared that Christian books comprise 11.4% of the market share for romance sales, and Christian book sales are up 30% from 2005. Good news for those of us writing inspirational stories. An added note, the Faith, Hope and Love Chapter now boasts 192 members! My husband flew in on August 3, and we spent four glorious days in Marin Country, located just over the Golden Gate Bride. He’s from San Francisco, and we visited family in San Rafael, which is always a treat. We also hit our favorite Marin spots. Lunch in Sausalito, on the bay with a breathtaking view of SF, is always our first stop. We spent a day in Napa and an afternoon in Tiburon, where we always have lunch on the water at Sam’s. Two giant jellyfish, each at least a foot in diameter, swam by. Glad I was sitting on the dock and not in the water. We also toured a delightful museum that had been the office and home of the Tiburon railroad and shipping dock engineer. I came home ready to tackle the final rewrites on my fifth book. PROTECTING HER CHILD, will be out in May 2009 and is the second book in my Magnolia Medical series. By the way, my second book, SCARED TO DEATH, won the Daphne du Maurier award for inspirational romantic suspense!!! What a surprise! Steeple Hill senior editor Krista Stroever was in the audience. She had acquired the book, and it was a thrill to share the win with her! I'll share more about my time in San Francisco next week. Until then, happy writing! CHECK OUT MY NEW WEBSITE CREATED BY AUTHOR DESIGNS!!! 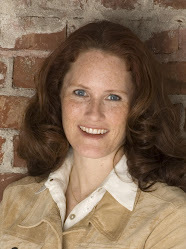 Today we're welcoming Sonny Montgomery, the heroine of Her Only Protector by Lisa Mondello, August 2008. Wow, you've just had quite an adventure. I'm the youngest of 3 kids and the only girl in my family so you can imagine how by two big brothers try to protect me. But when my brother Cash was kidnapped trying to rescue his infant daughter from a Colombian drug lord and my oldest brother Dylan needed to rescue him, there was no one else who could go to Colombia and rescue my neice. Except me. Being a computer geek by trade, I found out where my niece Ellie was. All I had to do was go in and get her and bring her back to the United States. It's not as easy as it sounds! 2. So, during the book you met Gil Waite. Tell us a bit about him. What was your first impression? When did you know it was love? When I first met Gil I thought he was a deranged stranger trying to keep me and Ellie from boarding the plane to the U.S. Then I found out he was a bounty hunter looking for my brother, which completely annoyed me. But he has a warm, loving side to him and he's wonderful with Ellie. How could I resist? I'm as stubborn as they come. It's a Montgomery trait. But stubbornness is sometimes necessary. I'm also a computer hacker by trade, which has helped me and my family get information we needed to help my brother. Losing people I love. My family has been through so much, especially my sisters in law, Serena and Tammie. And my brothers' jobs - Dylan working as a Chicago cop and former marine, and Cash working as a DEA agent - means they're in harms way much more than what makes me comfortable. The most danger I get into in my job is getting a paper cut! I'd love to be more adventurous. Yeah, I know, going to Colombia to rescue my niece probably tips the scale quite a bit, but I didn't do it alone. My faith is my rock and the foundation by which I live by. Without the Lord, I couldn't feel strong. More resolute that God is a guiding hand in my life. My family's journey and rescue are proof of God's grace. Trust is a big issue. It took a lot for me to trust Gil to help me get out of Colombia. But having faith and trusting in the bigger plan that God has for me is what got me through my ordeal. Chocolate Mousse. Do I even have to say why??? Thank Lisa for sharing Sonny with us. What an interesting story. And the Winner Is!!!!! Everyone but especially Linda Goodnight! It's been over a week since I sat in the audience during the RITA ceremony holding my best friend Cathy McDavid's hand and grinning foolishly at my editor Krista Stroever. When they announced Linda Goodnight's name, I relaxed and let go of Cathy's hand. I still grinned at my editor. I'm thinking whoever was holding Linda's hand shouted OUCH. And, if you think Linda was grinning, you should have seen her editor. 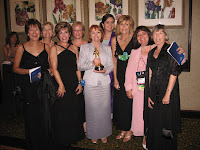 For those of us who are still Ladies in Waiting or dreaming of being a RITA finalist, here is some of the joys, fears, and yes comaraderie that went into this year's Inspirational RITA category via an interview with our Harlequin's own Linda Goodnight. Question 1: How did you feel waiting for the winner's name to be announced. At the moment the title of my book was announced as the winner, I went blank. I never heard my name called. Even though I don’t believe in out-of-body experiences, that’s the only way I can describe those few seconds. I remember looking at my editor and saying, “What? What did she say?” I still get chills just thinking about that amazing, exhilarating rush of disbelief and realization. Question 2: How did 'you' really feel up there on stage? Even though I tried to remember to thank all the right people, I forgot so many. I wanted to honor the other finalists, whom I have come to admire, and like as women as well as wonderful, worthy writers. Believe me, to win in a category with those other authors means something very, very special. Question 3: What happens after you step off the stage, both at RWA and then later on at home? Wow! I couldn’t stop giggling during the rest of the ceremony –and shaking. I hadn’t been shaky before but I sure was then! My editor kept whispering, “I told you. I told you.” And then I’d squeeze Miss RITA and start giggling all over again. After the ceremony, there was this rush of people-friends, other finalists, editors-toward me, and that continued for the next hour or so. Frankly, I loved it!!! I’ve said this over and over again, but it’s so true. Awards mean nothing if you have no one to share them with. The absolute best part of winning the RITA is that first hour after the program. I have two very sweet memories that I will treasure in my heart forever. The other finalists, Pamela Tracy, Susan Mae Warren, and Irene Hannon were the first people to greet me. Looking so beautiful in their fancy duds, they hugged and smiled and congratulated me, though I know they had to be disappointed. That meant so very much and always will. See why I admire these women? They’re the real deal. The second treasured moment was seeing my friend, Libby Banks. Libby and I have been friends and critique partners since before I sold that first book. Libby is a strong woman, an attorney who keeps her emotions in check. But there she was, coming at me through the crush, moving people out of the way like they were bowling pins, tears streaming down her face. We fell into each others arms, laughing and crying. Sweet, very, very sweet. The next day, after two hours sleep, (Who needs sleep when you have adrenaline?) my family greeted me at the airport and took me out to dinner. Then, when I turned down the road toward home, I was met with a big congratulations sign erected by my neighbors. Since getting back home, my email box has been full of congratulations. My chapter sent flowers. My phone has rung off the hook. My editors have emailed. Even some agents that I’ve never met have emailed! It’s truly been an exciting, amazing, and fulfilling ride. Thank you for letting me re-live the excitement. Now, back to work. I have a book due! I'll bet that everyone here enjoys reading, but I'm curious--have any of you thought about writing? Have some of you started writing a manuscript? Finished one? During the Faith, Hope and Love One-Day Conference in San Francisco, I gave a workshop on "Career Building, Before and After the First Sale." I addressed some steps that a writer can take to reach her (or his) goal of being published...or to reach the second and third sales, and beyond. During the next few weeks, I'd like to talk about some of these steps. Even if you aren't thinking about writing anything yourself, it might be interesting to glimpse some of the effort it takes for a writer to finally see her name on the cover of a book! First of all, I think all writers start out as strong readers---people who have had a love of books long before they ever thought of sitting down at a computer or yellow legal pad with a pen in hand. A deep love of books is what draws most of us to try our hand at something that, at first, may seem like an impossible dream. I remember the first time I met an author for the first time--the lovely Kim Cates--and I was in awe. She was so sweet, so genuinely nice. That moment was a turning point for me, because until then I'd had some sort of nebulous image of authors residing at some unattainable altitude in the stratosphere. It suddenly seemed as if it might be possible to write, too! There can be a lot of reasons to write. Perhaps it’s the social networking with a group of local writers, your friends. The fun of coming to conferences. The joy of creating a perfect sentence. You'd like to leave your family a memoire. Perhaps you don't care if you are never published. That's perfectly okay. But if you do want to be published, or have made a sale or two and want to continue on, then I have some ideas that might help you along that journey. I hope you'll stop in on Sundays during the coming weeks! I had a great time in San Francisco, mostly sightseeing. I had never been to SF and I wanted to see the city. You never know when you'll place a book there. I have one in the back of my mind as I type. The weather was great!!! It didn't rain once I was there which is a good thing since I didn't take an umbrella or a raincoat. During the daytime it was usually in the 60s while it got colder at night (in the 40s at least once). I thought I had packed correctly with the temperature in mind, but I hadn't. I only wore half of what I took--the other half was inappropriate. I didn't take into account the wind chill factor. There were a lot of places where the wind would whip by you, chilling me even when I wore a warm jacket which I purchased in Chinatown for $10. That was my best buy in SF. While I was contending with a cooler climate, back home my family was contending with temperature above 100 (and humid). I wasn't looking forward to getting off the plane and feeling the heat (over 105 when I returned home). I saw the redwood forest near SF and the Napa Valley. I went to the Golden Gate Park as well as the Golden Gate Bridge which we took to get to the forest. I traveled through some quaint towns around SF and I spent a lot of time in Chinatown where my roommate shopped until I dropped. I went to Fisherman's Wharf and it was so crowded that day (a gorgeous Saturday) that I was amazed so many people could be in such a small area. The seals were neat to see at the pier. My favorite thing, however, was seeing the most crooked street in the world and finding myself having to go down it in the car. We hadn't intended to do that, but that was the only way to go so down we went. I walked the streets until my feet hurt so bad they were going numb. The worst part of walking in SF is that the landscape isn't flat in a lot of places. Some of the streets we were on were at a VERY steep angle. There was one time the taxi I was in went down one that I had to close my eyes. I felt like I was on a roller coaster or in some chase scene I'd seen in a movie. The taxi cab driver was going fast! Six members of his blog met several times during the conference. In the pictures below you will see Roxanne, Lisa, Debby, Terri, Pamela and myself enjoying the food at a late lunch and the party Harlequin throws for its authors. Back from RWA in San Francisco! 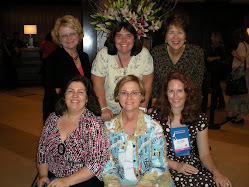 This year's RWA conference was a complete success for me. Not only did I have a blast hanging out with the other CRAFTIE Ladies of Suspense, I learned a lot and got a boxful of free books that will keep me reading for a while. Of course, since I shipped the box, I'm still waiting for DHL to show up at my door with them. But that's okay, I'd picked up a copy of Terri Reed's Double Jeopardy before I boarded the plane and just finished it last night. Fabulous book for anyone looking for a great weekend read this weekend. If you haven't checked out the Double Jeopardy Interview by hero Professor Patrick McClain, make sure you do. I must admit that I'm partial to books set in Massachusetts and since this book was set in Boston, as I was reading it felt like walking through my old stomping ground. You'll also be meeting Sonny Montgomery, the heroine in my new release HER ONLY PROTECTOR which is available this month from Steeple Hill Love Inspired Suspense. Do make sure you check that out as well. There are so many highlights of my trip to San Francisco. The Harlequin party was fun and I got to see a lot of other authors I don't get to see much during the conference because we're all so busy. Meeting with the Steeple Hill editors is always a treat as well as hanging with so many of the Love Inspired authors. 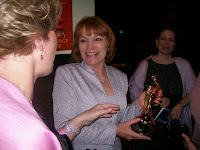 It was really thrilling to see fellow Love Inspired author, Linda Goodnight, receive her Rita award. I was a little disappointed I wasn't able to get in to see Alcatraz, and I never made it to China Town. But I have an excuse to go back and visit. I did get the chance to do a bus tour of the city and see all the beautiful architectural features on the buildings. Now that I'm home and unpacked (still doing laundry) I'm back to work on my writing. I just sent off a new proposal to my agent and am hard at work on a new series. I'll give you more details later on that. So yesterday morning I was feeling pretty good. I've gotten some good writing chunks in, feeling on track. I know what I have to write each week to hit my deadlines, and pretty much hit them the first week. No sense of panic. Just a sense of deliberate "have to run this race to the end" kind of feeling. I worked on ACFW conference projects in the little pockets of time over the afternoon, so that I could jump into writing when we got home from church. Then it was 11:15, and my baby was still crying and I hadn't written one word. I have to trust God that He will help me redeem every moment as I race to these deadlines. That He will help me do everything I need to for the ACFW conference. That somehow I'll get everything done in a way that pleases Him and brings Him glory. As I stare at my keyboard and begin to feel the pressure build again, I know I have to trust Him. And if you feel inclined to pray that He will help me focus on the truly important things and let the others go, I'd so appreciate it. He's been so abundantly faithful. Now it's my turn. This coming Saturday at 12-3pm at Bob's Beach Books in the beautiful Lincoln City, Oregon I will be signing my July release Double Jeopardy. There will be several local Oregon authors signing and we will have a wide variety of romance subgenres to choose from. If you're in the neighborhood, stop by and say HI! I loved to see some friendly faces. Today we're welcoming Daniel Stillwater, the hero of Hidden Deception, Leann Harris, August '08. Wow, you've just had quite an adventure. I am a detective for the Santa Fe PD. I was raised here in the city. Both of my parents are dead. My wife recently died of breast cancer. I was serving with my National Guard unit in Afghanistan when she became sick. I came home to care for our eight-year-old daughter. How I managed to get in the middle of this case was my partner and I had the evening shift when we were notified of the murder at Past Treasures. Elena found the body of the victim in her family's antique store. The man version is the lady found the victim, but that incident spun her into her past, with it's ghosts and pain. What was your first impression? That my heart suddenly decided to come back to life. Elena was very shaken when first questioned. When she came by the office early the next morning, I interviewed her over breakfast. I knew that Elena had nothing to do with the murder. But at breakfast, she'd overheard a friend ask me about my daughter's soccer match. The next time I interviewed her, she asked who won the soccer game. In the midst of her own pain, she thought of others. I finally admitted it when my daughter invited Elena to her birthday party. Elena came and gave April a lovely cross as a birthday gift. I didn't want to be involve again after my wife's death, but Elena and April didn't give me a choice. I'm good detective. I can sense when things aren't right. My greatest weakness is when I think I can do things in my own strength. God sometimes has to tap me on the shoulder and remind me He is my strength. That happened when both my daughter and Elena were at the mercy of a killer. God protected them when I couldn't. Loving again. I failed my 1st wife, Maria, so badly. We were high school sweethearts. After we married, April came so quickly. I joined the Army to make ends meet. I felt more connection with the men in my unit than my wife. I didn't reup with the army, but joined the PD and also signed up with the National Guard. We were activated and sent to Afghanistan. When I discovered Maria had breast cancer, I was able to come home. Maria and I made peace, but to love again, I wasn't sure I could do it. I want to be the best father I can be. I pray I can do that. I failed as a husband. With God's help, I can be the father I need to be for April. Doubting myself. I knew April needed all of me, not some part-time Dad. I also carried a lot of guilt. It crippled me. I couldn't forgive myself for failing my family. I saw in Elena the same crippling guilt I had. As God gave me the words to speak to her--words of comfort and support, He pointed out that I needed to do what I told her to do. I am free from guilt and have been forgiven. That freedom brings me joy. I have also been given a wife who loves God, April and me. That verse of scripture I held close to my heart while I was with my unit in Afghanistan. I rested in that promise. When Maria was dying, I repeated that verse to myself. I again rested in the verse when I tried to comfort my daughter after her mother's death. Apple pie.I'm a good American success story. Thank you Leann for sharing Daniel with us. This book sounds great. Can't wait to read it. I just returned home from San Francisco. What a wonderful adventure I had. The first RWA conference, way back in Anaheim, has always rated high on my favorite memories list, but this one tops it. See, back in Anaheim - ever so many years ago -I remember standing at the hotel room window and watching two of my roommates get on the Harlequin bus. I so wanted to be there. Two years ago I sold to Harlequin. I met my goal. Now there are other goals and this conference filled one very nicely. Attending conference as a RITA finalist is like being a princess. First, before the conference there is a bevy of duties that range all the way from sending pictures for the huge powerpoint presentation to getting a first crack to an editor/agent appointment to getting a three page here's what you do how-to. I also received flowers from Harlequin. During this time you get to call your editor and scream, call your agent and scream, and call your friends and scream. Your writing friends will scream with you. Your non-writing friends will ask who Rita is. At conference is even better. First you get a ribbon announcing to the world (well, at least to all the people who take the time to look at your badge) that you're a RITA finalist. Then, there's a reception where they hand out certificates (I'm heading out to store today to buy a frame for mine). Before the ceremony there's a rehearsal. For the Inspry Rita Gang, we all met and went to lunch before this event and almost missed it because we couldn't get a cab big enough for everyone. (I still feel bad that Karen Harter went in the second cab). Then before the real deal, Krista and Melissa took their nominees (Me, Irene Hannon, and Susan May Warren) along. Finally, there's during the event. There's reserved seating upfront. And it takes forever to get to the category you're in. Finally, they announce a name. It wasn't mine, which meant I got to relax for the rest of the ceremony. Linda Goodnight, however, had to go on stage and be witty. I came home exhilarated, ready to write, and grateful to my God, my friends, the judges, and to RWA. I had a fabulous time.